On this site you will find information about our current and past Brownfields projects through programs supported by U.S. EPA and the IndianaBrownfields Program. See the EPA Brownfields Website and Indiana Brownfields Program Website for resources and detailed information about brownfields. Indiana 15 Regional Planning Commission has a Brownfields Team composed of a representative from each of our six counties. Along with Lisa Gehlhausen – Executive Director. Due to the success of our 2008-2011 and 2016 Assessment grants as explained below, Indiana 15 will continue to seek additional resources from the EPA to conduct Phase I and Phase II environmental site assessments on properties with the potential for hazardous substances. Thanks to all who support our Brownfield redevelopment efforts. In 2013 Indiana 15 received a U.S. EPA Brownfields Assessment Grant for Coalitions. The successful 2013-2016 was awarded on September 4, 2013. This three-year project is to conducted Phase I and Phase II Environmental Site Assessments as well as remediation planning onBrownfields throughout the six-county region. For further funding and program information see EPA’s fact sheet on the award. Several assessments on both private and public properties have been completed. If you would like to determine if your property is eligible please contact our office. In 2011 an EPA Brownfields Clean-up Grant was awarded to Spencer County. More information on the project can be found at the following link: United Energy, Spencer County, Indiana. In 2010 an EPA Brownfields Clean-up Grant was awarded to Pike County. More information on the project can be found at the following link: Jean’s Junction, Pike County, Indiana. Indiana 15 has also been working with our partner Counties and Communities to continue to clean-up contaminated and/or blighted sites after we have conducted environmental assessments. 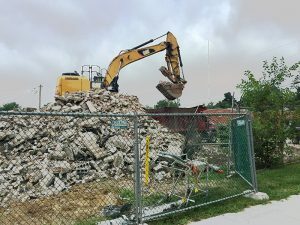 On June 22, 2012 Indiana 15 submitted OCRA Clearance Applications on behalf of the Town of Birdseye and Orleans to demolish Old Birdseye School and the Former White Castle Plant in Orleans. The applications were successful and grants were awarded on August 21, 2012 in the amount of $162,000 to the Town of Birdseye, and $342,000 to the Town of Orleans. Deconstruction bids were opened for Birdseye on December 6, 2012, and for Orleans on November 29, 2012. The buildings were demolished in 2013, with a grant completion date of February 28, 2014. Birdseye plans to keep the site open green space on the site of the old school and Orleans plans to construct a new fire station on the site of the Old White Castle Plant. In 2008 Indiana 15 received a grant from the U.S. Environmental Protection Agency to conduct Community-Wide Environmental Site Assessments (ESAs). The grant was for $200,000.00 for Hazardous Substances ESAs, and $200,000.00 for Petroleum ESAs. Additionally the Indiana Brownfields Program contributed $60,000.00. The three year grant period ended September 30, 2011 in which 16 Phase I ESAs and 15 Phase II ESAs (on 11 sites) were successfully completed. Also several Remedial Action Plans and Human Health/Ecological Risk Assessments were completed to lead the commission on to present-day cleanup projects described above. A map of thebrownfield properties assessed through this grant initiative can be found on EPA’s website.